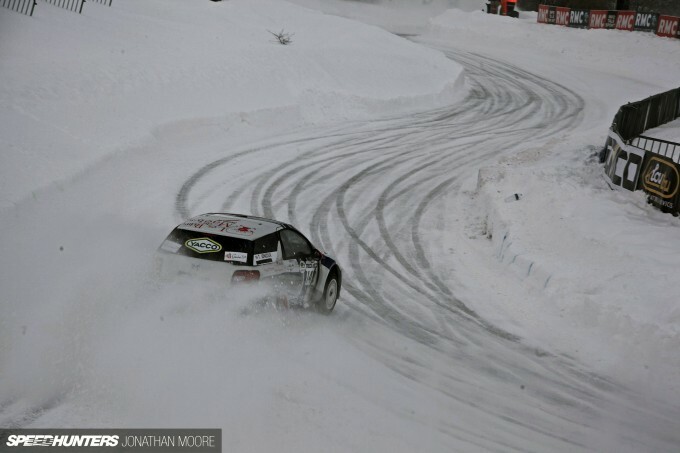 Heard about the Trophée Andros? Well, let’s get introduced. Start off with a core of time attack. Add a base layer of Gallic attitude. 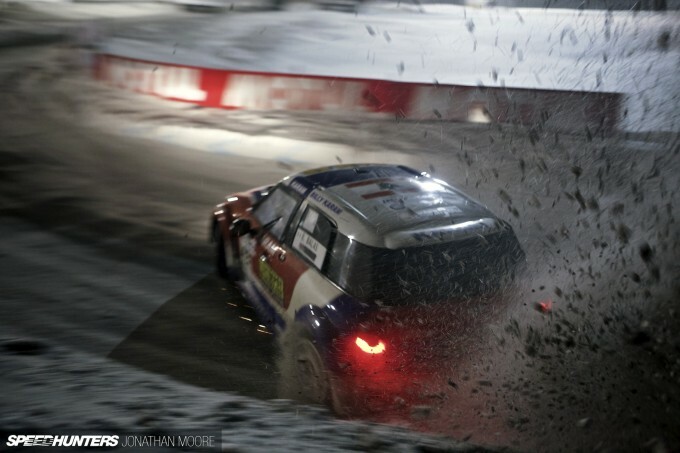 Zip up a suit of armoured rallycross around it. Power all four wheels. Put chainsaws of tyres on them. Make all four steer, too. Pump it through with a bolt of electricity every so often. Take two wheels away even. Then put the whole thing on snow and ice. Oh, and turn off the sun. 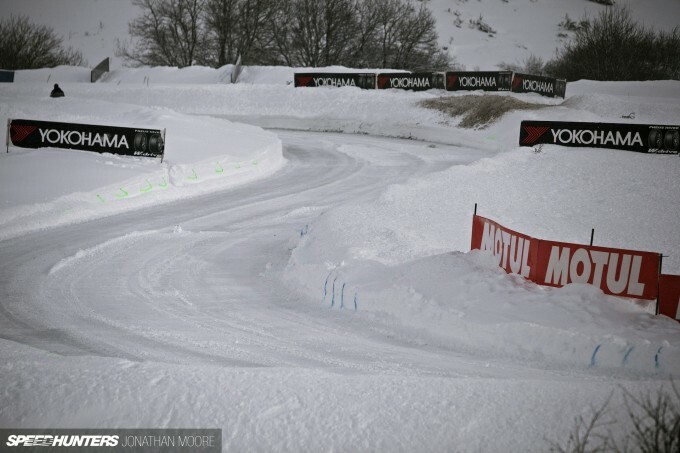 The Trophée Andros, France’s best kept secret, is an eight round series of maximum attack held at high altitude; flat-out racing that pits man and machine versus snow and ice against an epic backdrop of mountains. It’s something I’ve been wanting to get to see for years. I remember being in the Alps a couple of years back, jumping onto a chair lift and almost dropping my poles in surprise when we sailed over the top of an ice racing track. 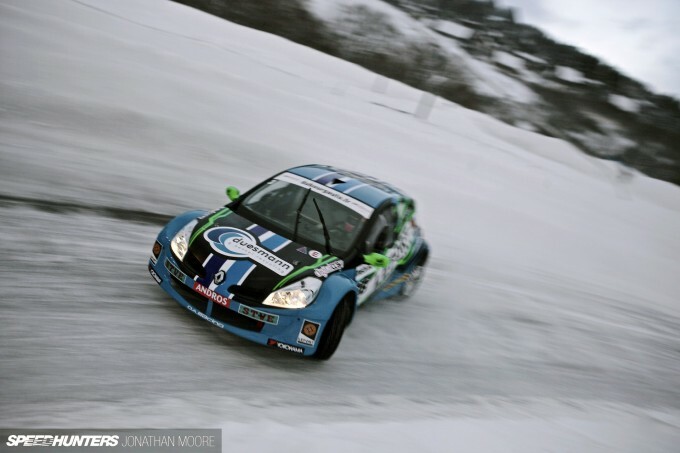 I’d heard of the Andros Trophy – many famous racing drivers, predominantly French, have tackled it over the years – but hadn’t realised just how intertwined it is with France’s network of ski resorts. 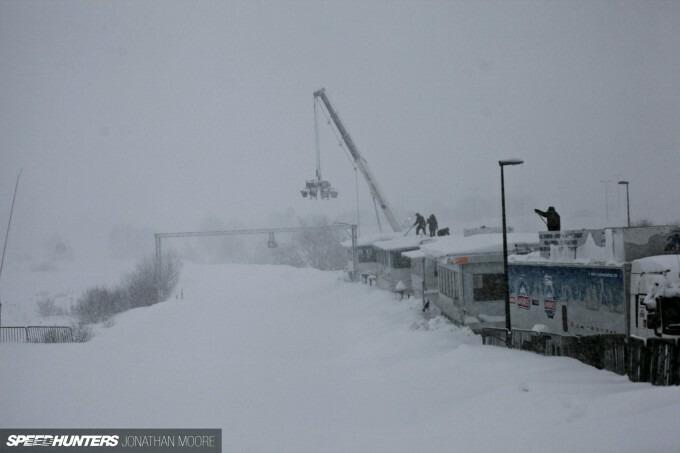 The tracks are mostly literally at the base of the ski stations they visit. 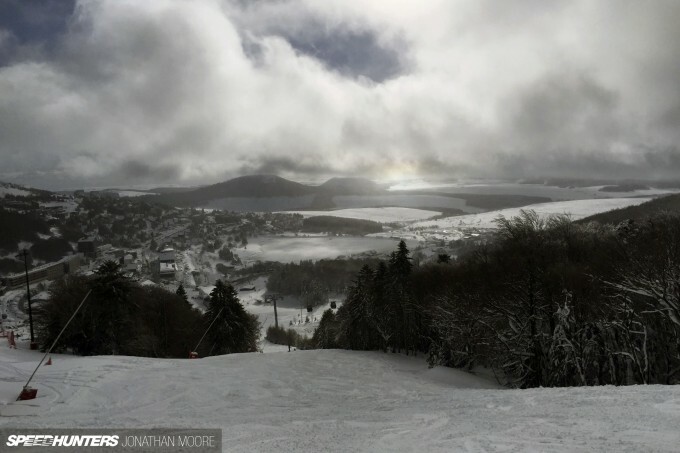 It means you can ski during the day, then watch racing in the evening, which sounds like a pretty perfect combination to me. The whole concept is completely barmy though. 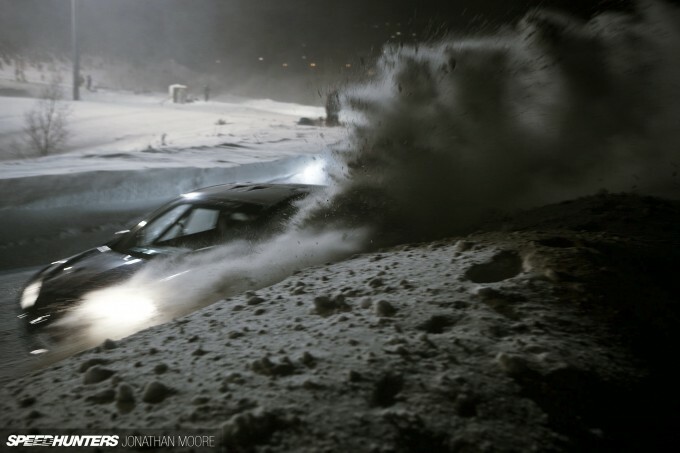 Snow-covered mountains hate cars, surely? 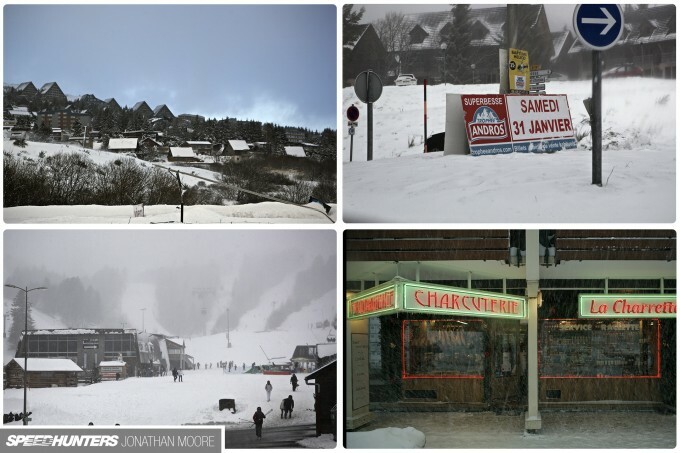 Week in week out, come Saturday morning every European ski resort typically sees the same two things: people digging their ice-encrusted cars out of tons of snow and forlornly trying to get them started to escape, whilst the next mass influx crawls up the mountain and into the madness. But trying to set up a race track in the midst of all this looked like it would be as successful as trying to build a sand castle in the face of an advancing tide. The top of a mountain is no place for a car. 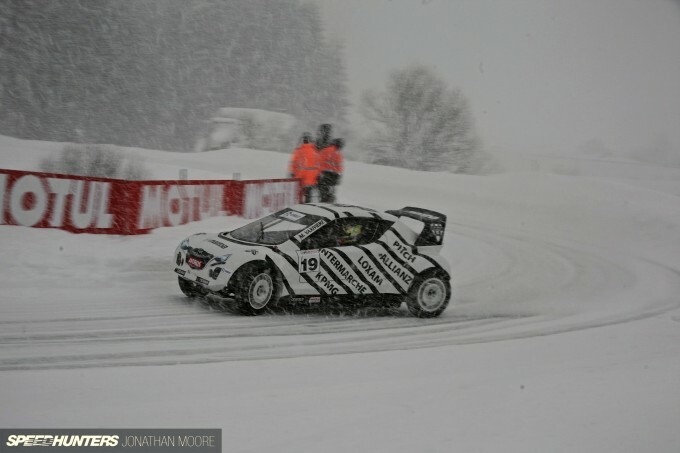 With the weather conditions that France had been hit with over the previous week, it was hardly even the place for skis, let alone racing cars. With the competition compressed into a single day, we’d arrived in the mountains a couple of days early, looking to score some extra shots. It turned out to be of no benefit. The snow dropped in never-ending waves, piling up the already deep covering into seemingly impenetrable drifts. The sun got a look in for about half an hour each morning before giving up, relinquishing control to an inevitable blanket of low cloud. 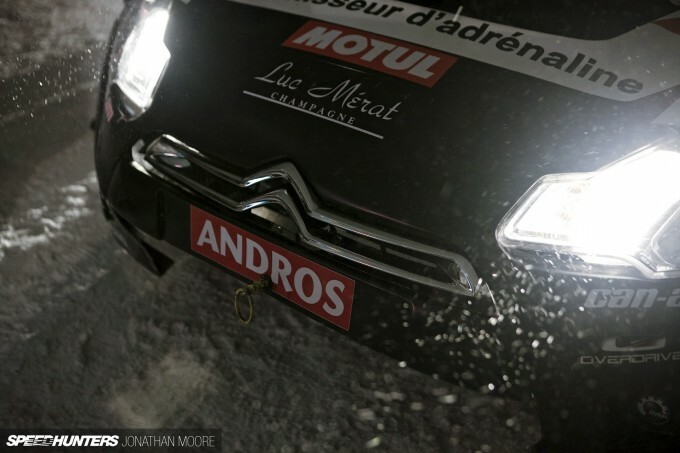 The Andros teams somehow all managed to make it into Super Besse over late Thursday night and Friday morning. The larger teams incredibly managed to manoeuvre their big articulated race trucks into place in what’s normally a regular car park; smaller teams operated off trailers, but everyone was under canvas. This was not luxury. 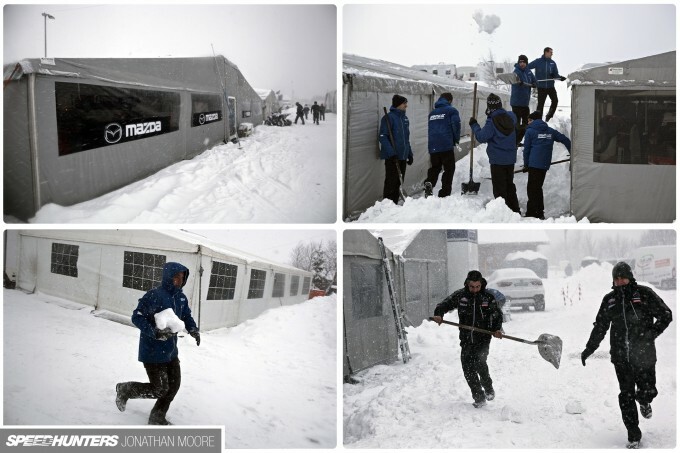 The teams had to wage a constant battle against the snow piling up on over the makeshift paddock, brushing it off the top covers to keep them from tearing under the weight, and digging out passageways. 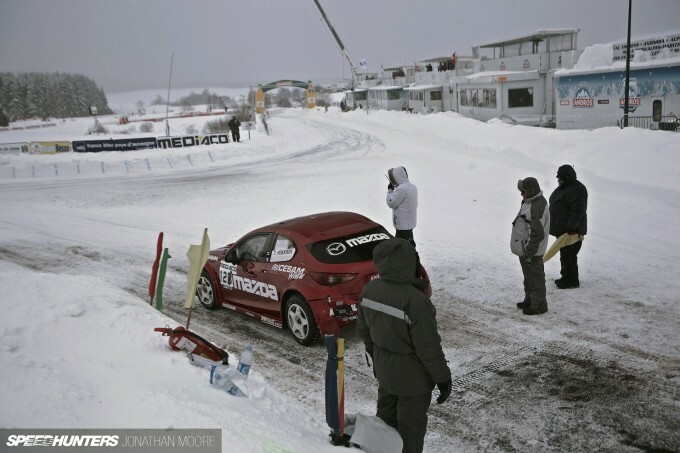 Of course, the inter-team rivalry wasn’t just going to be on track: epic snowball fights were a given between mechanics! Super Besse is in the Massif Central, the mountain range in the middle of France. 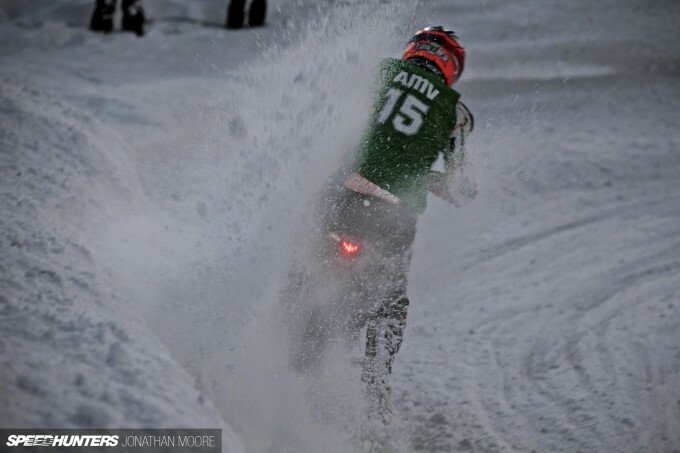 It’s less well known than the Alps in the east and the Pyrenées in the south, but it’s become the traditional season ender for the Trophée Andros. The town of Clermont-Ferrand, home to the iconic Charade circuit, lies 50km to the north, so the area is not really a stranger to racing. 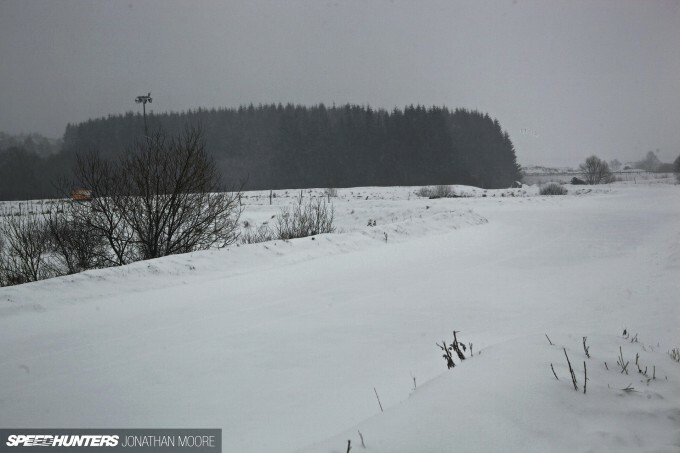 The circuit at Super Besse sits on a tarmac base, though there was no sign of that when I arrived. 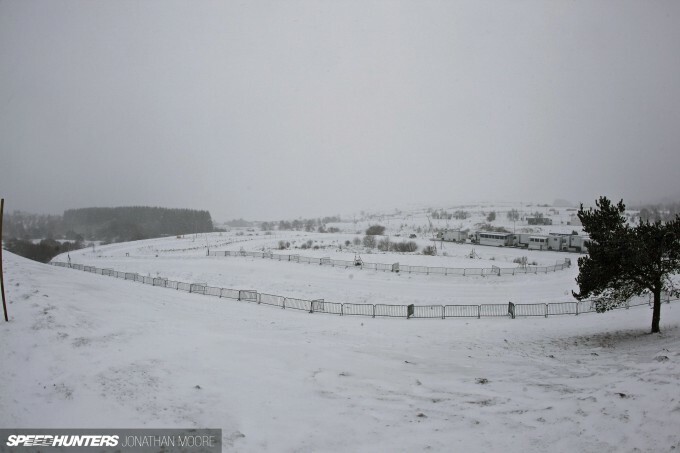 Well, there was no track at all! At just 800 metres long, it’s almost like a little kart track, basically comprising four right handers and one long left. That simple description does it a disservice, of course: the important thing to remember is that there aren’t really any straights, and we’re talking about cars that travel sideways more often than forward. 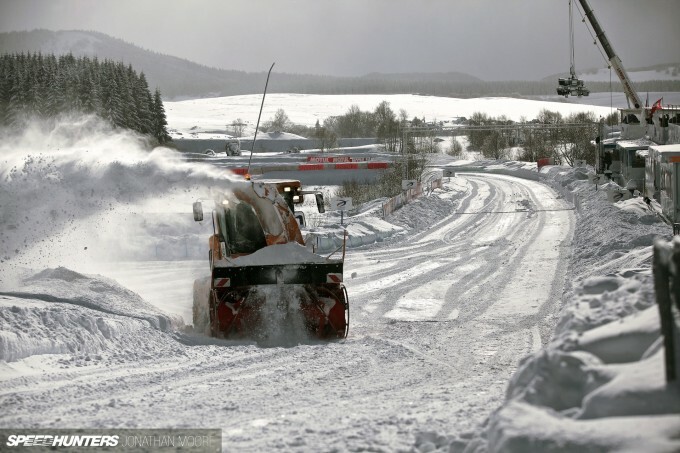 Any idea about Friday evening practice were quickly dismissed – another dump of snow smothered the area, and the heavy machinery was needed to clear the village as a priority. The track would have to wait till morning. I originally planned to walk the course, but after sinking down to my knees at the first step, I decided discretion would the better part of valour on this occasion. 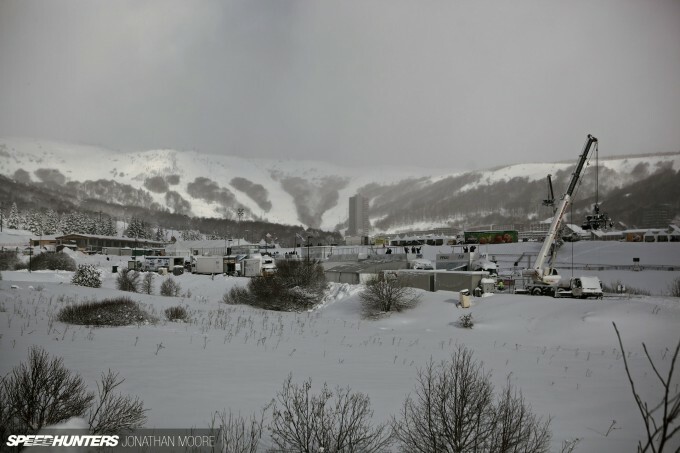 With TV rigging crews running cables and another team completing the signage, there was that dawning realisation of the heavy snowfall of the day before not being a shock to anyone. 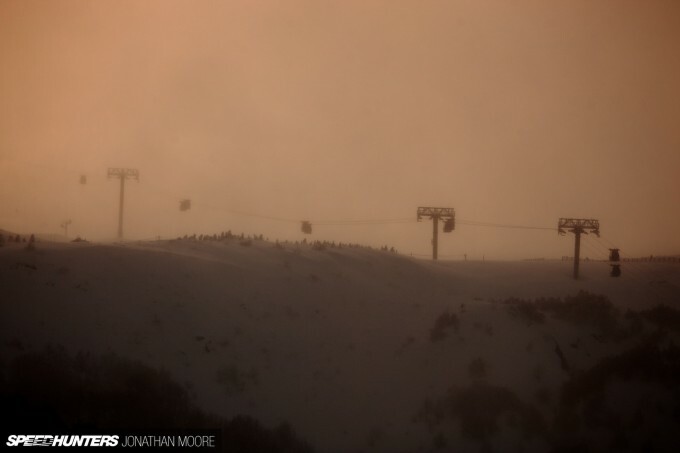 Conditions like this are a given of course! Soon enough it would be time to get to business. It Works? It Just Works! 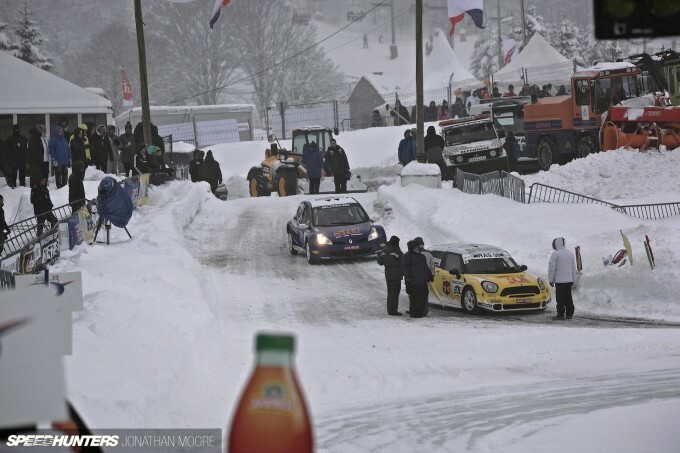 The Trophée Andros came about when one of France’s top rallycross drivers in the ’90s, Max Mamers, teamed up with the boss of Andros, a company famous for their fruit products. 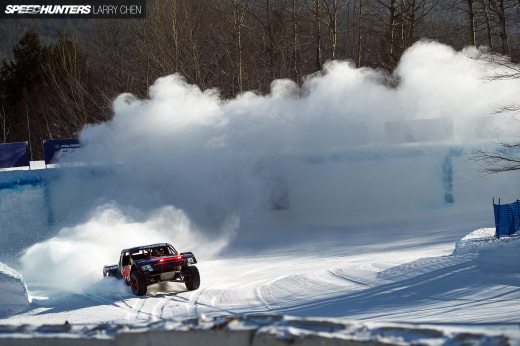 (They now do frozen desserts – maybe as a result of all this ice racing experience?!). 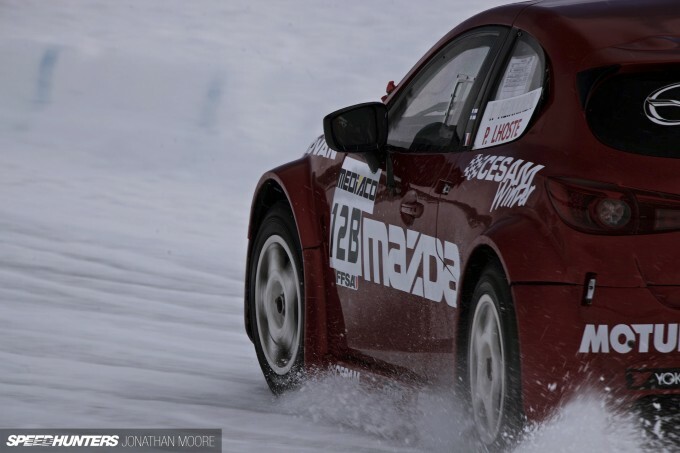 The pair spent a winter racing about on ice, and the idea of a series proper soon hatched out. Coincidentally, I’d seen Max’s rallycross car, a Murena, at the Matra museum a couple of years back, without realising the link. 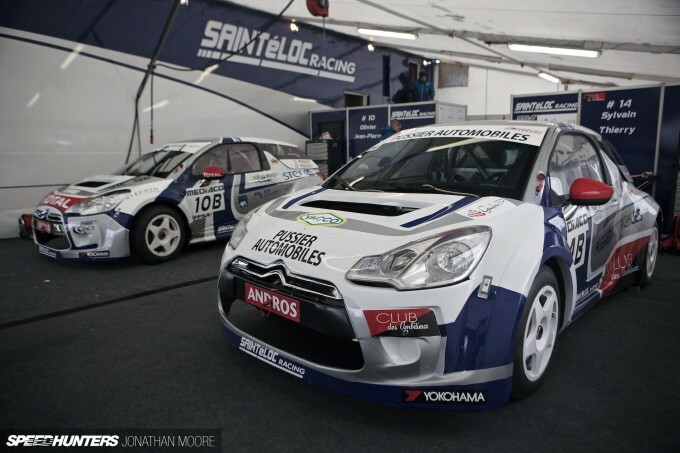 The series is now in its 24th season; French drivers from Formula 1, World Rally and the World Touring Car Championship often sneak away during their off-season to join the ice racing regulars. F1 legend Alain Prost is a two-time champion; WTCC champ Yvan Muller has won the series an incredible 10 times, ratcheting up 46 wins in the process. Romain Grosjean and Sébastian Loeb have both recently joined the series for one-off appearances; Jacques Villeneuve has driven in the past. Olivier Panis is also a regular: he joined the our friends at WRT this year, and has had a stellar season. We’ll be talking to him in a following story. 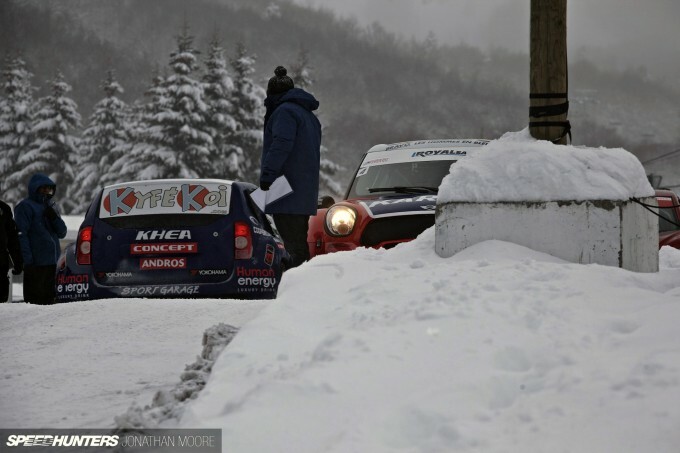 Top of the pile in the Trophée Andros are the Elite cars. These are full tube-frame silhouettes: lightweight, purpose-built racers made exclusively for the series, with four-wheel drive and four-wheel steer. 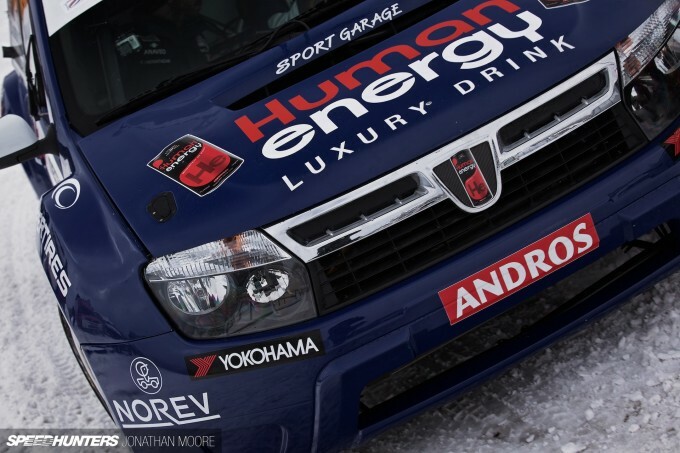 Surprisingly, each car is shared – not during a race, but across the top two tiers of Andros, Elite (mostly pro drivers) and Elite 2 (gentleman and up-and-coming young racers). One driver jumps in as the other jumps out at the end of his run. Names are attached with velcro strips, and numbers have a B added to them for the Elite 2 drivers. Cars from Renault, Dacia, Mazda, Toyota, Citroën and Mini all compete, in body shape at least. Under the clamshell panels are generic chassis used across all the teams. 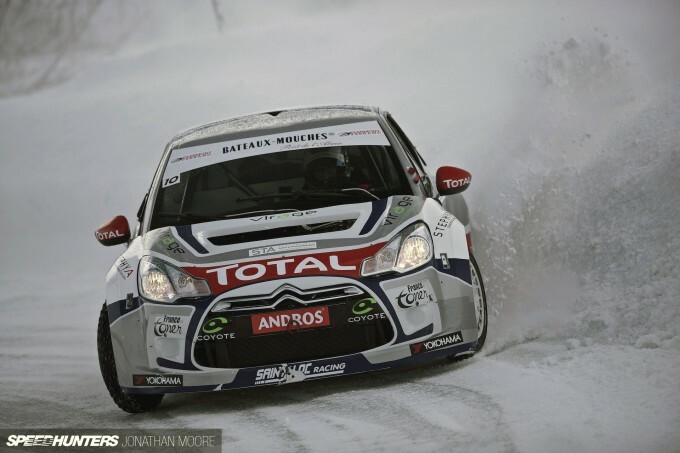 The cars use mid-mounted 3.0-litre V6s that push out 340hp. With that power, they need every one of the 250 studs on the narrow tyres they use. I’ll be showing more of the make-up of these cars when I look at WRT’s Toyota Auris. They are fearsome little beasts. 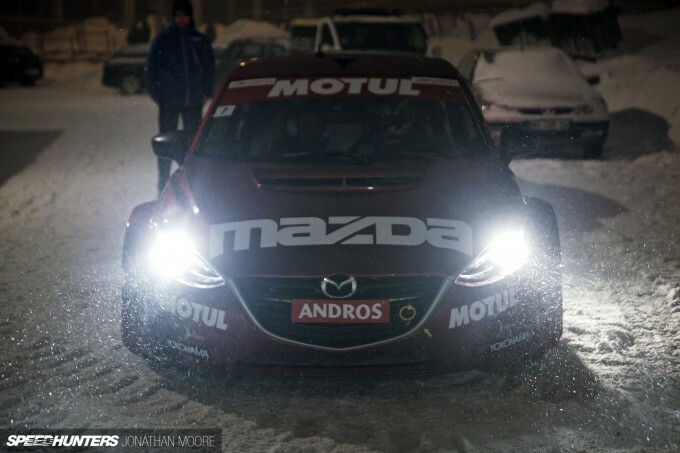 Barely any slower than the Elites, the third grid is the ERDF Trophée Andros Electrique. These are electric-only, rear-wheel drive one-make racers constructed by French hybrid experts Exagon, who also make the Furtive GT. 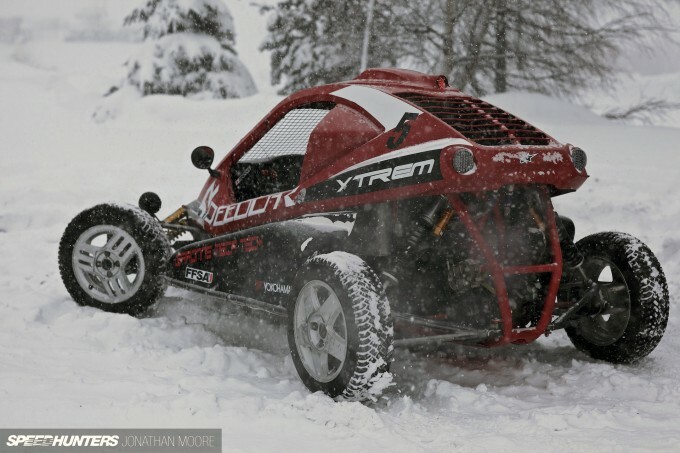 They’re capable machines, with 800kg and with 122hp, good for 100mph on the ice. A 35-minute drive time is more than enough for the short sharp shock of Andros events. The fourth example of four-wheeled machinery is in the Trophée Feminin, exclusive to female drivers, which uses these little 600cc buggies. Finally, something I was absolutely not expecting. Bikes. On ice. The 16 riders in the AMV Cup made the cars look almost sensible. With feet down for balance through corners, I was shocked that there weren’t 16 broken legs at the end of each session. 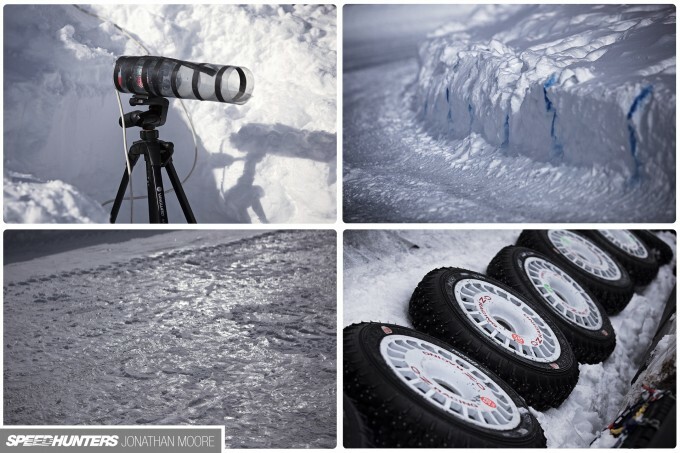 One thing I hadn’t realised about the Trophée Andros was the way the event is run. On such tight, unforgiving tracks, out-and-out racing would inevitably lead to almost instant mass destruction. So, the core of the series is a time attack element, comprising 75 per cent of the points on offer for each event. 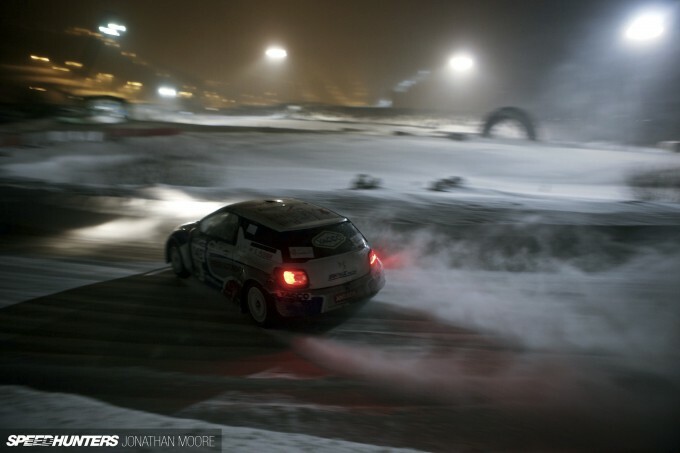 Bolt on a set of freshly frozen tyres, and it’s you against the ice and the clock. 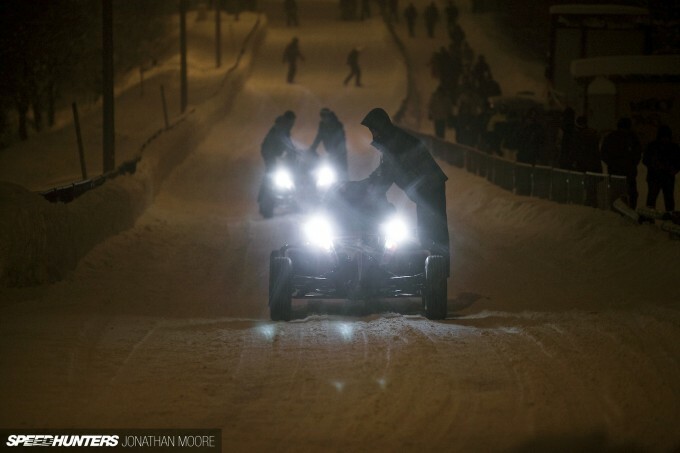 A team mechanic would ride down from the snowy paddock with each car to the pre-grid, squeezed in on top of the fuel tank in the cabin of an Elite car or hanging off the side for the buggies. Up to four cars get sent out at a time, at short intervals, with the order set by series position. Each car puts in four flying laps, with the cumulative time their overall result for the session. Each driver got two sets of timed runs, with the finishing positions in each added together to create an combined figure used to decide the overall position and points – plus the grid for the finals. Basically, that allowed perhaps a single small error on one lap. Make another, and you’d blown it. With me so far?! There was a large part of me that took issue with the series website’s proclamation that the system was simple… Still, it didn’t really matter, because what was happening on track was always spectacular. Off the line, and boot it. With an official on the start-line counting down the laps, every run was about total commitment. 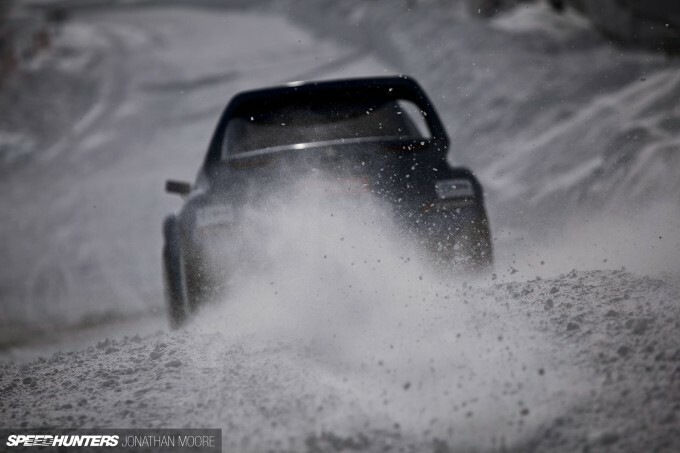 Smack a snow bank, keep your foot in. Wipe off a panel, doesn’t matter. Less weight to carry. Just concentrate on that clock. 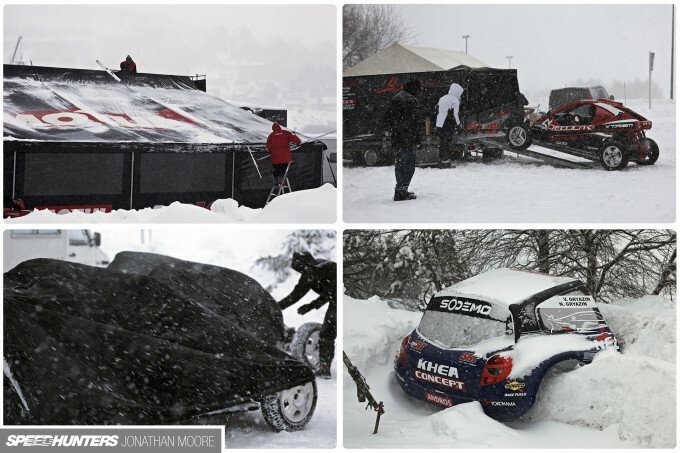 The conditions varied from hour to hour, session to session, grid to grid. 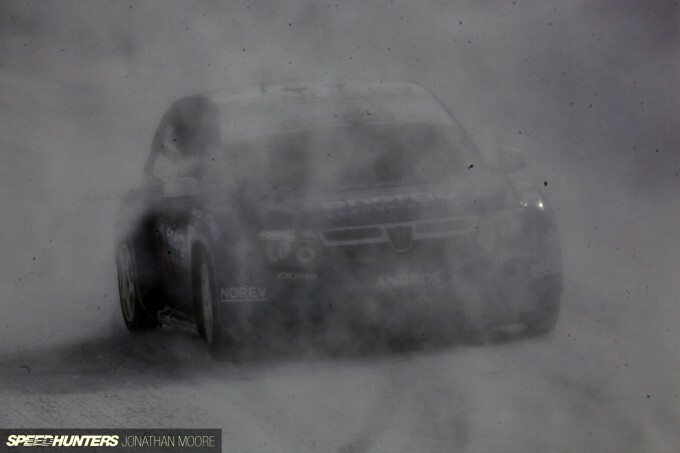 Sun one minute, snow the next, then fog and mist… At one stage there was a concern that tarmac would come through, which it turns out is not an unusual occurrence (some events have lacked snow to the extent that the whole race has been on raw, icy tarmac), but the snow just kept coming. 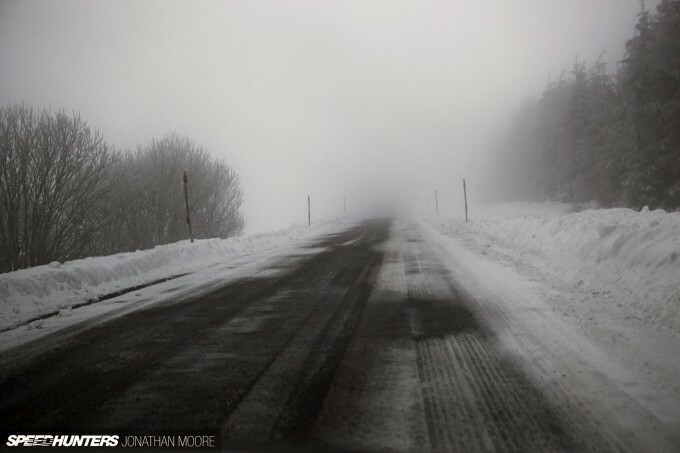 My feet disappeared into the snow; camera viewfinders became blocked with snow – miraculously they kept working. This was just practice… With the increasing snow-fall compounding delays in the schedule, the timed sessions would be held in the late afternoon gloom and into the dark of the early evening. Oh yes, and those segments were only 75 per cent of the points. The final quarter on offer? To be earned during multi-car, no-holds-barred, rallycross-style assaults later that night. What the ice hadn’t already sliced off, other cars would. We’ll head into the dark next. 1. Yeah, I should be saving plane ticket money. 2. Can I get a just-modded car, like, say, a Focus RS or Smart forfour with a cage, seats, and 330 horses, in this? If not, how much is one Elite or Elite 2 chassis and powertrain setup? And can I just call Varis for an original Ford Focus RS shell that can fit? 3. I wanna know about that 25% of the points. 4. Seriously, Lancia has got to wake up and make a new Stratos. And it should look like a slightly curvier old Stratos. The drivetrain would fit like a glove. UWerqxTeam_MJ 1: Yes you should! You've got about eight months. Plenty of time. 2: Nope, you've got to use a homologated chassis, but then you can put anything like on it! I'll be doing a feature on WRT's Auris in the near future. 3: Tune in next time on... Speedhunters! Jonathan Moore UWerqxTeam_MJ 1. Alms. Alms. Spare me a few pennies, for I'm just 17. 2. So, I have to buy two things: the chassis and powertrain and my choice of shell. Man that's expensive. 3. I will. Oppositelock needs some more of these. 4. Wait, do replica shells count, or does it have to be current or last-gen silhouettes? UWerqxTeam_MJ Jonathan Moore 1: Okay, okay, you got me. I'm in. 2: You got it. I'll have to check prices. We can go halves: we need two drivers anyway. 4: Open to choice. 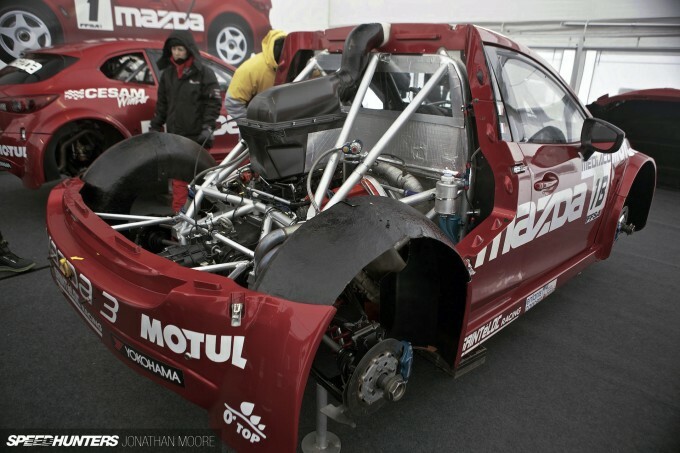 I think only Dacia and Mazda are anywhere near 'works' entries. 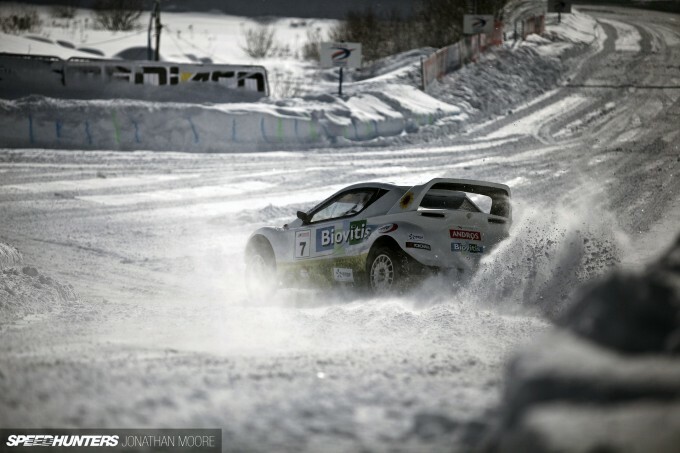 Clearly Andros is the Group B methadone program I've been craving, I might start a campaign to get Motors TV/Extreme to show this as it's beyond awesome, looking forward to the next informative article on the sport! Jonathan Moore UWerqxTeam_MJ Here's my address, linked as a Google Map link. I warn you though, I'm in the Philippines. Am I am just barely at the middle class line. In your standards, I am poor. And I don't have a license. Simply put, I am not worthy. Jonathan Moore TarmacTerrorist Indeed, it's on Motors TV, I don't remember if there were Live races though. Happy to see another coverage near my home town! One of my best friends will run the Exagon and I'll be glad to show you more than what you saw last week. Yep. Just found it, series link set - I should of googled before I commented dammit. TarmacTerrorist If you are looking for a modern replacement for your Group B cravings, then give the World (formerly European) Rallycross Championship a look. If you were build a modern Group B car chances are it would end up looking a lot like a rallycross Supercar! 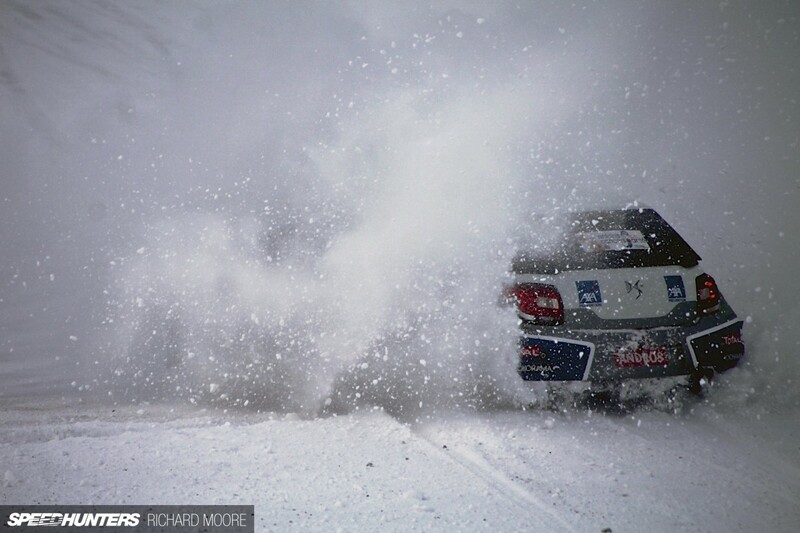 So great to see the Andros get coverage on Speedhunters. It's yet another superb Championship that seems to rarely get any mainstream coverage. Would love to see it in person, though I suspect it is considerably warmer watching it from the comfort of my armchair!